He attacks you when you're alone, when you're most vulnerable, and emotionally cornered. There's no way to escape him, and he can't be caught. When you see his golden roller blades and hear his bent golden bat in the distance you know he's coming. You can run, but there's no way you can hide from him. He is.... Lil Slugger. Paranoia Agent is an original anime from the late, great, Satoshi Kon. This mystery/Psychological/Horror is thirteen episodes long and originally aired in 2004. 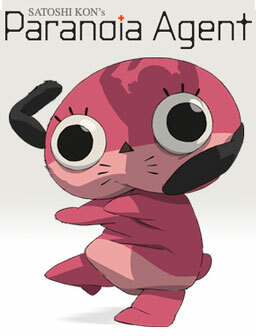 It was produced by Madhouse Studios and was licensed by Geneon, though they went under a few years ago, and Paranoia Agent has yet to be relicensed. So, if you ever want to watch it, you're only chance is used DVD's or online streaming sites. Tuukiko Sagi, a shy character designer who created the immensely popular pink dog Maromi, finds herself under pressure to repeat her success. As she walks home that night, she is attacked by an elementary school boy on inline skates. Two police detectives, Keiichi Ikari and Mitsuhiro Maniwa, are assigned to the case. They suspect that Tsukiko is lying about the attack, until they receive word of a second victim. Soon the attacker, dubbed Lil Slugger, is blamed for a series of street assaults in Tokyo. None of the victims can recall the boy's face and only three distinct details are left in their memories: golden inline skates, a baseball cap, and the weapon: a bent golden baseball bat. Ikari and Maniwa set out to track down the perpetrator and out an end to his crimes, but it's not going to be easy. First off, I am going to mention this. I first saw this series in 2004 on Adult Swim, when I was about thirteen/fourteen years old. After watching the first episode, I couldn't fall asleep for days because I had evil visions of Lil Slugger in my head. So, I never finished the show. I finally watched it all the way through last year with some friends and I completely fell in love with it! It's funny how your idea of something can change after watching it again. The look of the series is almost flawless. The animation is good and the scenes are put well together. The only real complaint I have is some of the distorted faces some of the characters make. It doesn't seem to look very well with the intentional look and style of the series. The story itself is almost flawless as well. For the first six or seven episodes, it revolves around six people and their attacks: Tsukiko Sagi, Akio Kawazu, Yuichi Taira, Harumi Chono, Taeko Hirukawa, and Makoto Kozuka. If you have seen this series before then you already know why I didn't mention Shogo Ushiyama and Masami Hirukawa. For those who haven't, well, I'm not planning on spoiling it too much for you. As far as voice acting goes, it's pretty much flawless. You find the English voice actors matched with characters extremely well, and it's rare for someone to find a bad role. In other words, you have a harder time picking a favorite character based on the voice. Sam Riegal (Fate/Stay Night, Prince of Tennis) as Lil Slugger/Makoto Kozuka is the right amount of creepy/silly needed for the two, very different, roles. Mostly certainly credit goes to Carrie Savage for her role as Maromi (Vampire Knight, Baccano!). It's cute and adorable mixed with just the right amount of creepy, making this a very odd stuffed toy that could probably kill you in your sleep. One of the genre's in this series is Psychological, so where does that really come in? To put it simply, it's human coping skills. People are backed into little emotional corners due to personal problems in each victim's life. For instance, Tsukiko Sagi is stuck due to the amounting pressure to repeat her success after Maromi became super popular. She ended up as a victim of stress and paranoia, and, as a result, so appears Lil Slugger. There's real way to explain it without really spoiling it, so I'll just go ahead and say it. Lil Slugger isn't a real person. It's just something that was created to put blame on instead of claiming blame for your own actions. Again, coping skills. The question then becomes this, where did Lil Slugger really come from? Now I said that this series is almost flawless.... Almost. Back to what I said about the story. It's good for the first six or seven episodes, and then, to an extent, it kind of goes downhill. For a few episodes, it's all just fillers. One of them is about three people who met online trying to commit suicide together, another about all the workers for the Maromi TV show getting killed off, and last about some gossiping women telling stories about Lil Slugger. It would be fine if these stories weren't right in a row, one right after the other. I can understand some time needs to go by to help develop the main characters in the show, like the detectives and Tsukiko Sagi, but three fillers is kind of overdoing it a bit. Granted, the are fun to watch. After Episode 10, the real story kind of kicks back in with Detective Ikari's wife Misae. Once that episode goes through, the story finally reaches it's climax and slowly comes down to it's end result of everything going back to normal.... For everyone but Maniwa any way. In the end, Paranoia Agent is almost completely flawless in every angle. From story, to animation, to it's characters; this anime is certainly one that will get you to start thinking about what's real and what really isn't. Or, if not that, give you nightmares of Lil Slugger for a few days. Did you think about picking the ultimate Bitcoin exchange service: YoBit. YoBit enables you to claim FREE COINS from over 100 distinct crypto-currencies, you complete a captcha one time and claim as much as coins you can from the available offers. Did you know that you can shorten your links with AdFly and make dollars for every visitor to your shortened urls. If you're looking to buy bitcoins online, Paxful is the best source for bitcoins as it allows buying bitcoins by 100's of different payment methods, such as MoneyGram, Western Union, PayPal, Visa, MasterCard, American Express and they even allow converting your gift cards for bitcoins.